Narayana Kalpa is herbal medicine acting on mind and brain. It gives relief from stress, depression, anxiety, insomnia (sleeplessness), restlessness and mental fatigue. It is proprietary ayurvedic medicine manufactured by Sri Sri Ayurveda Trust, a part of Art of Living Group. Narayana Kalpa ingredients provide strength to the brain, improve mental tolerance, calm the mind, and reduce negative effects of stress. These ingredients are commonly used for reducing the feeling of uneasiness, nervousness, and sense of panic. Narayana Kalpa has following healing properties. 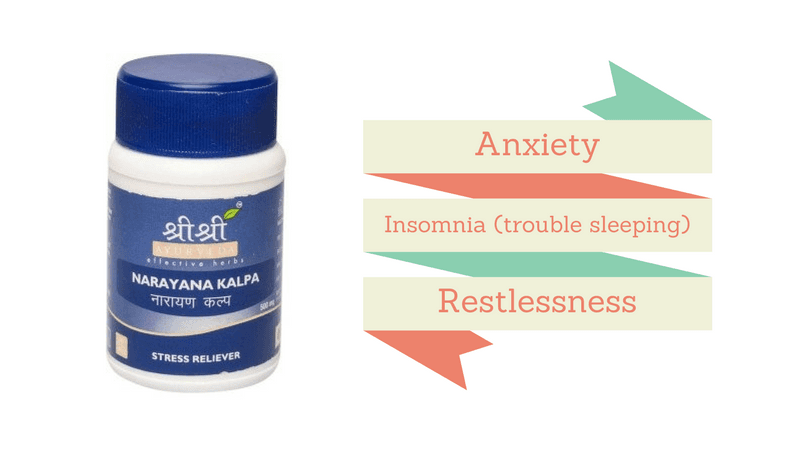 Most if ingredients in Narayana Kalpa also act as a memory booster and anti-depressant. It is also likely to be beneficial in cases of stress-related spikes in blood pressure. A review of Narayana Kalpa ingredients suggests its beneficial effects in overall all types of diseases related to the nervous system. Its ingredients exert a potent neuroprotective action. Yashtimadhu: Yashtimadhu has antidepressant, strengthening, anti-anxiety and anti-stress effects on the mind. It gives relief from restlessness, fear, palpitation, nervousness, tiredness, and trouble sleeping. Shankhpushpi: Shankhpushpi reduces mental fatigue and enhances mental tolerance. It provides relief from irritability, restlessness, aggressive behavior, stress, vertigo, anger, and moodiness. Shatavari: Shatavari provides strength to the body. In addition, it also contains a good amount of folate ( a natural form of folic acid). Folic acid deficiency can also be an underlying cause of anxiety and depression. So, Shatavari helps to prevent and reduce the symptoms of anxiety and depression. Jatamansi: Jatamansi has potent anxiolytic, antidepressant and neuroprotective actions. It helps to reduce stress and improve mood. It reduces mental fatigue and induces the feeling of well-being in the patient. It increases the monoamines levels in the brain, which helps to reduce depression. Ashwagandha: Ashwagandha also has de-stressing effects. It also improves mental tolerance and makes the person energetic. It also relaxes the mind and reduces stress. It improves sleep, so beneficial for treating sleeplessness. Brahmi: Brahmi is also nootropic herb. It improves cognition and relieves mental stress. It balances the hormones in the brain and relaxes the mind. It is commonly used for mental fatigue, stress, anxiety, depression and several other mental disorders. Narayana Kalpa contains herbs, which are considerably safe and well-tolerated. There are no side effects observed with Narayana Kalpa.